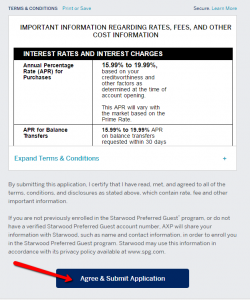 The Starwood Preferred Guest Credit Card from American Express is an amazing travel card created for those of you who love Starwood hotels. 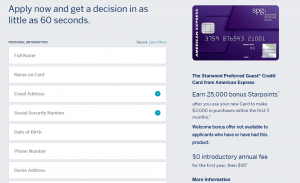 With up to 5 starpoints for each dollar spent on Starwood reservations and a 50,000 signup bonus this card offers you the best opportunity to get your direct hotel discounts. Plus, the card has a $0 intro fee for the first year. 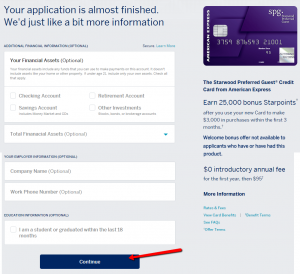 Step 1: Visit the credit card’s homepage and click on the ‘Apply Now’ button. Step 2: Enter in the appropriate fields the following information: your full name, name on card, email address, social security number, date of birth, phone number and home address (including city, state and Zip code). Step 3: Continue by introducing your financial information, including: your total annual income, your non-taxable annual income (optional), the source of your income and your Starwood Preferred Guest Number (optional). After providing this data click on the ‘Continue’ button. Step 4: Carefully read the terms and conditions related to this card and then press the ‘Agree and Submit Application’ button. Step 5: After the next page is loaded, you can provide some additional information regarding your financial assets, your company name and working phone number as well as the educational status. Remember that this information is not mandatory but, if provided, it can help the outcome of your application. Click on ‘Continue’ to proceed verifying your application. Step 7: In the next window, choose whether you’d like to complete the form right away and submit your application or do it after you receive the email. If you do not submit the form you might receive a message similar to the picture below. Make sure to follow the instructions in order to facilitate the processing of your online application. Q: What is The Boingo American Express Preferred Plan? The enrollment to The Boingo American Express Preferred Plan is required if you want to enjoy unlimited Boingo Wi-Fi on up to four devices at more than 1,000,000 Boingo hotspots worldwide. All you need to do is to confirm eligibility and access Boingo’s Wi-Fi services by creating a Boingo American Express Preferred Plan account. Hotspots can be found in hundreds of airports, hotels and other popular locations around town. In order to see whether you are eligible for The Boingo American Express Preferred Plan, you should call the number on the back of your Card. Q: In case I change some of my personal information, should I inform the credit card issuer about that and how can I change it on my account? In case of any kind of personal detail change, such as surname, mobile phone number or home address, you need to inform the credit card issuer, so that it can be changed in their portfolio. You can do that by coming to the nearest branch and talking to the employees or by logging into your account online and follow the instructions that will lead you to make the necessary changes to your contact information.